It uses melted butter rather than room temperature butter. It’s from Cooking Light, so you can eat 4 cookies rather than just 2. Score. It’s easy and can be made all in one bowl. A plus for a girl like me who hates doing dishes. So what are you waiting for? 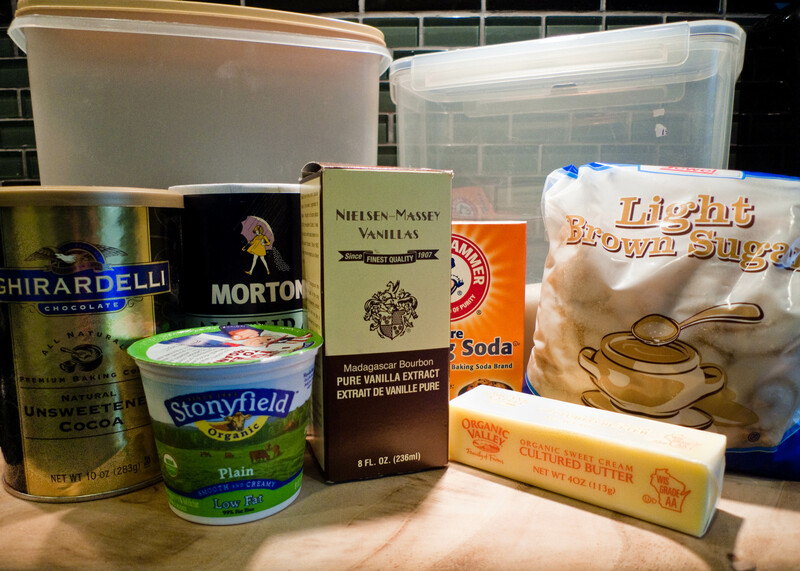 I bet you already have all these ingredients in your kitchen. Get to it! Melt butter in a large saucepan over medium heat. Once melted, remove from heat and add cocoa powder, granulated sugar and brown sugar. Stir until mixture resembles coarse sand. Add yogurt and vanilla, stirring to combine. Add flour, baking soda and salt, stirring until moist. Spoon dough (about 2 tablespoons worth) onto Silpat lined baking sheets (if you don’t have a Silpat, spray your cookie sheets with nonstick spray) approximately 2 inches apart. Bake for 8 to 10 minutes. 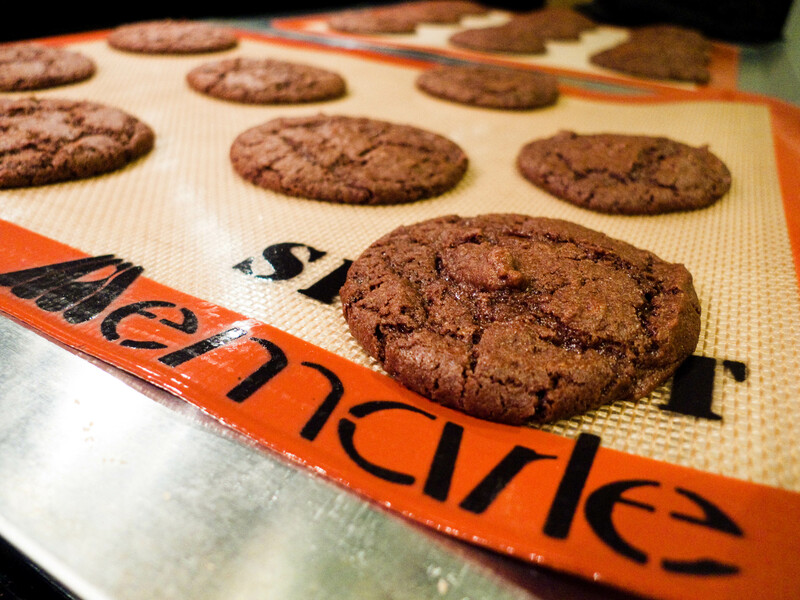 Let cookies sit on cookie sheets to cool for a few minutes, then transfer to a wire rack. 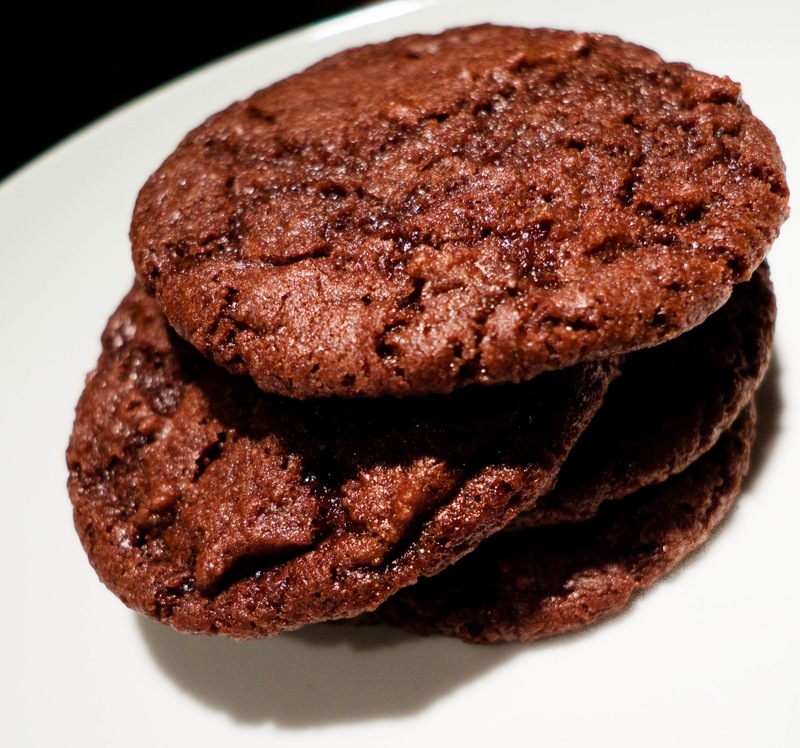 As if these cookies weren’t decadent enough on their own, they’re the perfect base for sandwiching. Nutella, ice cream, peanut butter, cream cheese frosting…any of these would be delicious stuffed between two of these thin cookies. Leave it to me to find a way to make a Cooking Light recipe not-so-light! Yum! I’m going to have to try this recipe when I’m doing my holiday cookie baking this year! Love that they are “ridiculously easy!” I might have to use these in my Christmas Cookie Swap! Thanks!!! I love easy one bowl cookie recipes. This is perfect when that late night cookie craving hits! I don’t have any yogart or applesauce. Could I substitute with a egg ? Or do you have any other ideas? Thanks. I think you could probably do two eggs as a substitute, although I haven’t tried it.